Little Tokyo Poised to Become First ‘EcoDistrict’ in L.A.
You are at:Home»English»Community News»Little Tokyo Poised to Become First ‘EcoDistrict’ in L.A.
“First Street North Vision” developed by the Little Tokyo community. The Little Tokyo Community Council and LTSC Community Development Corporation on June 24 announced their participation in Target Cities, a two-year partnership of nine development projects across seven North American cities designed to amplify and accelerate district-scale community regeneration and create replicable models for next-generation urban revitalization. 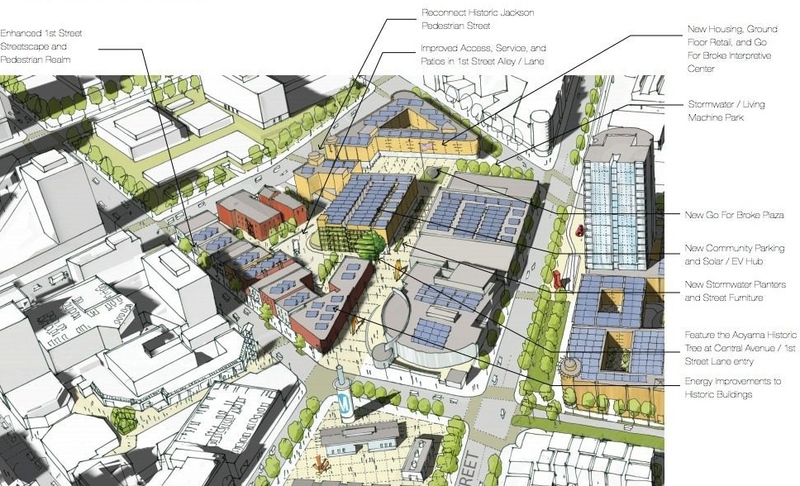 EcoDistricts, the Portland, Ore. nonprofit behind Target Cities, announced the new partnership as a commitment at CGI America, a program of the Clinton Global Initiative. The Little Tokyo Cultural EcoDistrict is designed to capture and highlight the neighborhood’s 130-year Japanese American history. Through an extensive community planning and visioning process, the community generated a broad-based consensus vision of “A Sustainable Little Tokyo,” which continues to inform the planning process as it moves forward. This vision aims to sustain the neighborhood’s resilient community based on small businesses, arts, and culture while promoting environmental performance and social equity. Several organizations provided support to this effort, including the Natural Resources Defense Council’s (NRDC) Urban Solutions Program, Global Green USA, Enterprise Community Partners, and LISC (Local Initiatives Support Corporation). Little Tokyo is poised to flourish into a thriving, sustainable transit-oriented epicenter with rich historic and cultural roots. A central feature of the EcoDistricts Target Cities program is to help communities in this position to ensure that long-term sustainability is a foundation for this sort of urban regeneration. A proposed catalyst project around a new light-rail station nestled within both Little Tokyo and the Downtown Arts District has catapulted a broad conversation about achieving environmental performance through renewable energy and water management, green building retrofits under the umbrella of community values for resource conservation (“mottainai”), consideration of children and future generations (“kodomo no tame ni”), and interconnectedness (“bambutsu”) – ideas generated through the “Sustainable Little Tokyo” visioning process. The Target Cities initiative will continue to engage artists, cultural organizations, business leaders, and international dialogue towards transforming behaviors and practices to achieve a sustainable future. This pilot project will also unlock tools and opportunities for the City of Los Angeles as a whole. “Neighborhood-based initiatives are key to transforming our city in a sustainable and culturally appropriate way. As we roll out our city’s sustainability plan later this year, we will be looking to places like Little Tokyo to teach us what is possible and to drive positive outcomes,” said Los Angeles Mayor Eric Garcetti. As a Target Cities project, the Little Tokyo Cultural EcoDistrict will incorporate the central principles behind the EcoDistricts Protocol, which guides the projects through district organization and governance, assessment, implementation, and monitoring. Each step of the EcoDistricts approach is built around an interrelated set of environmental, economic, and social performance areas: energy; equitable development; health and well-being; community identity; transportation; water; habitat and ecosystem functionality; and optimized materials management. In addition to the Little Tokyo Cultural EcoDistrict, there are projects in Atlanta, Boston, Cambridge, District of Columbia, Denver, Los Angeles and Ottawa, Ontario. EcoDistricts will act as a strategic partner to each of the project teams, helping them build robust governance models that will spur political and technical change, perform integrated assessment and goal-setting tasks and accelerate the deployment of strategies to deepen their impact. As part of their participation in Target Cities, each of the projects will help test and refine the emerging EcoDistricts Protocol. The Target Cities program will bring experts and leading practitioners to each community to help with their ambitious and challenging work. NRDC, Enterprise Community Partners, Global Green USA, and other partners will add strategic value to the support that EcoDistricts will be providing to projects, whether in the form of technical support, advisory services, financing, research and/or project deployment. This Little Tokyo partnership also leverages additional support from the Citi Foundation, the Low Income Investment Fund as well as NeighborWorks.